The maintenance of WordPress covers update of all its plugins and new versions. When new versions are available, an update of WordPress Premium theme (if installed) is carried out as well. The maintenance includes detections and repairing of defective links; both external and internal. Installation and setting up new plug-ins plus recommendation of new plugins for a particular website is part of the maintenance job. The data supplied by the user on WordPress remains safe through a number of functions. As a norm and routine work, back up your website to our backup server is done once a month. If your site goes down, it will restore from the last backup with one business day. Brandcrock provides Telephone support 5 days a week from 9 am to 5 pm and Email support 7 days a week is available. Up to 30 minutes of technical support each month by WordPress to edit, repair, optimize or install features to improve your site is part of the service and access to WordPress library of video tutorials is free as one of the best wordpress expert in Munich. The good news is that WordPress provides the backup of work and data if the website is hacked or the content is accidentally deleted, a backup is available to restore it. Back up your entire website including database, content, templates, themes and plug-ins to your backup server or storage per week. We can help in doing this part of the job if unluckily it may happen. It ensures that the user always knows exactly what happened on his/her site. It checks for malware and recommended SEO fixes which sites are linked to a particular site. It sends a monthly update report to the inbox. This particular account at WordPress gives and enhances the perspective on what the visitors are doing on the website, who they are and where they come from. BrandCrock GmbH, Munich Germany provides following WordPress services as they are wordpress expert in Munich..The jobs are carried out with excellence, expertise and smartness. The team is certified and experienced with a long list of the satisfied clients. 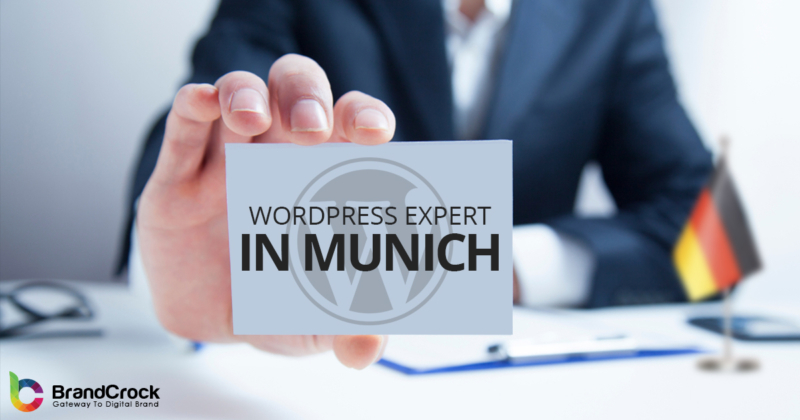 As wordpress expert in Munich we also provide the following services to our valuable clients. We have a long list of accomplished jobs and happy clients. The engineers at BrandCrock GmbH are certified, experienced and innovative Shopware developers. We aim at reducing the cost to one third never ever compromising on our high standards of the job we do. Kindly leave your comments below if you find this article useful while setting up your online Store with Shopware.